Proud parents Barry and Katherina with baby Luke Sheehy who was christened in the Church of the Assumption, Abbeyfeale recently. 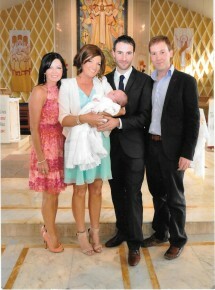 Stunning Picture of the happy Christening Day of Ava Caroline Wynne Christening. We wish them every happiness in the future. Congratulations to Lena Aleksandra Jaworska who was baptised in the Parish Church Abbeyfeale on 29th Dec. We welcome Lena to our christian community and parish. Congratulations to Kajus Berzanskis who was baptised on the 29th Dec in the Church of the Assumption, Abbeyfeale. Congratulations to Grace Hannah Enright who was baptised in Abbeyfeale Church on Sat 9th Nov.